Baked-goods mission accomplished, it was back into town to see what it looked like in daylight. 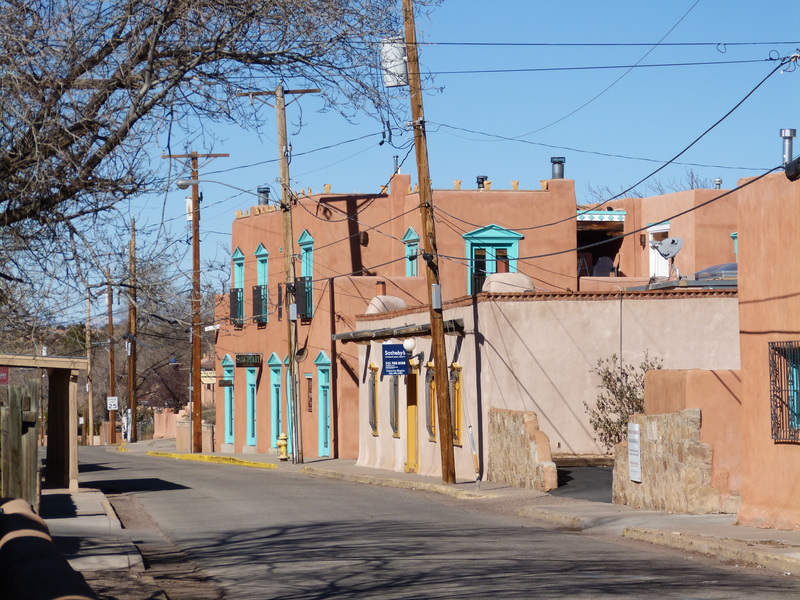 Most of the town seems to occupy low-rise adobe buildings with attractive wooden details, and more modern structures are either constructed traditionally or at least painted in the same colours, to great effect. We found it all quite charming. The town centre seems to be mostly occupied by art galleries, restaurants and touristy shops, and, it being a Saturday, there were plenty of people strolling around enjoying the atmosphere. 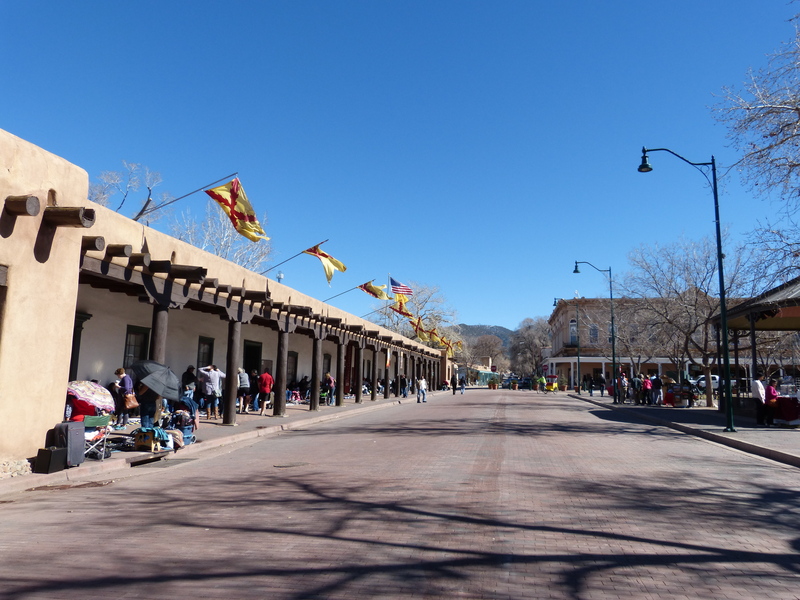 The Palace of the Governors provided an informative introduction to the settlement and development of Santa Fe, complemented by the excellent New Mexico History Museum across the way. 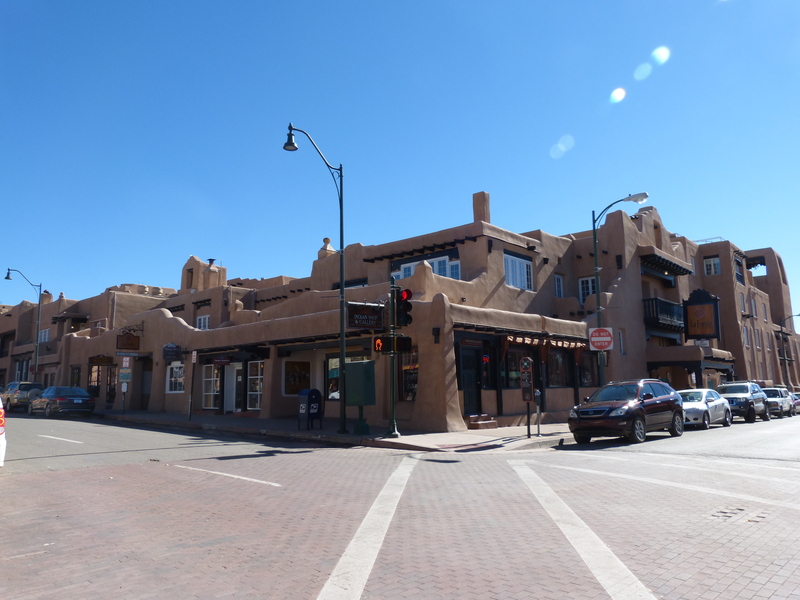 The Spanish arrived in 1610, were briefly driven out by the Pueblo revolt in 1680, then were gradually joined by all sorts of characters – European settlers, Wild West outlaws, beaver trappers, hoteliers, artists, nuclear physicists – as the frontier shifted time and time again. A sunny bench in the Plaza outside provided the perfect spot to eat a picnic lunch whilst watching tourists strolling around and local craftspeople selling their wares. 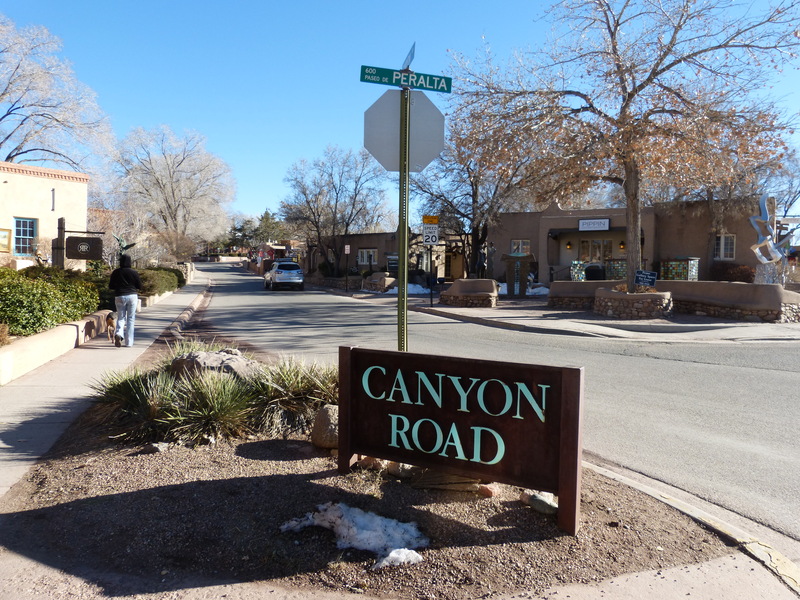 We passed the afternoon wandering around the town centre, browsing in shops and admiring artworks in the fancy galleries along Canyon Road. (which was originally the main donkey route out of town for people going out to gather firewood in the hills). 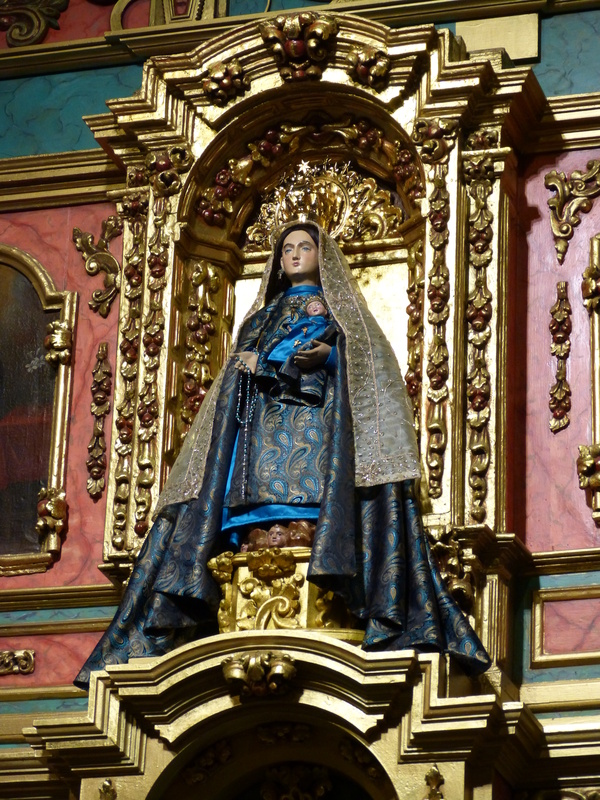 We also popped into the cathedral to have a look at the oldest statue of Mary in the United States – known as La Conquistadora, she arrived in Santa Fe in 1625, was saved from destruction in the Pueblo revolt and became a protective icon for the forces trying to recapture the town. 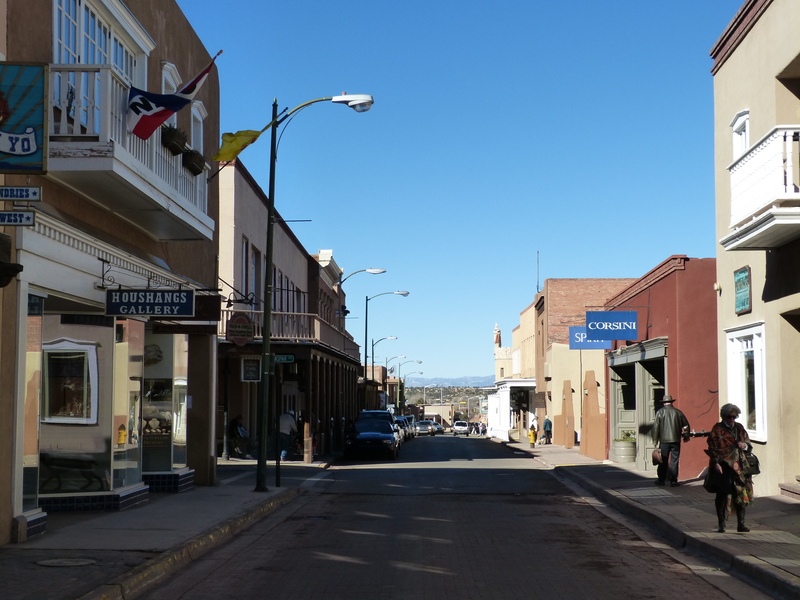 After brief pause back at the hotel we headed back into town for dinner at the Plazuela restaurant in La Fonda hotel. An earlier version of this had been established as part of the Fred Harvey railway-side dining empire, and although I don’t believe the modern iteration has much to do with its older cousin the menu looked appealing, and the decor was lovely. 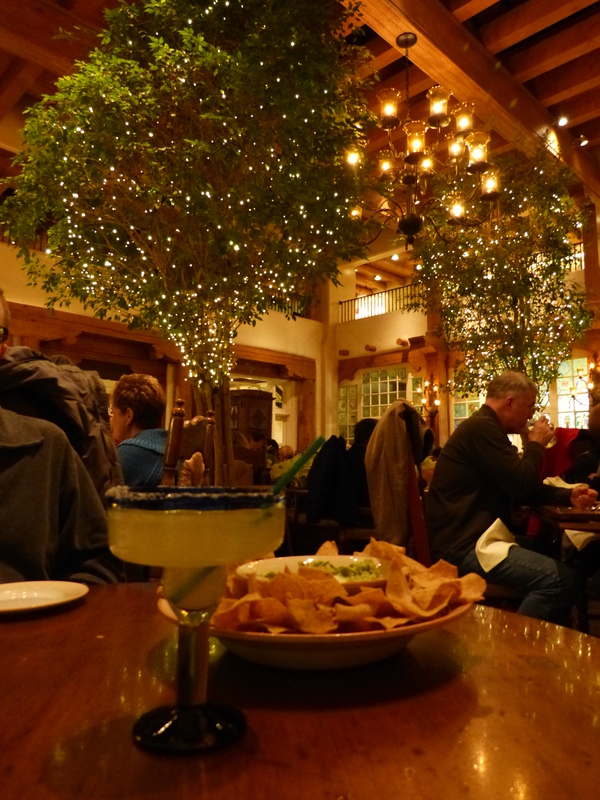 I did my best to stick to local fare, with tacos and a margarita, whilst Tom enjoyed a glass of New Mexican pinot noir and some southern-themed meatloaf, all preceded by a hearty bowl of guacamole (made tableside, which never fails to entertain). 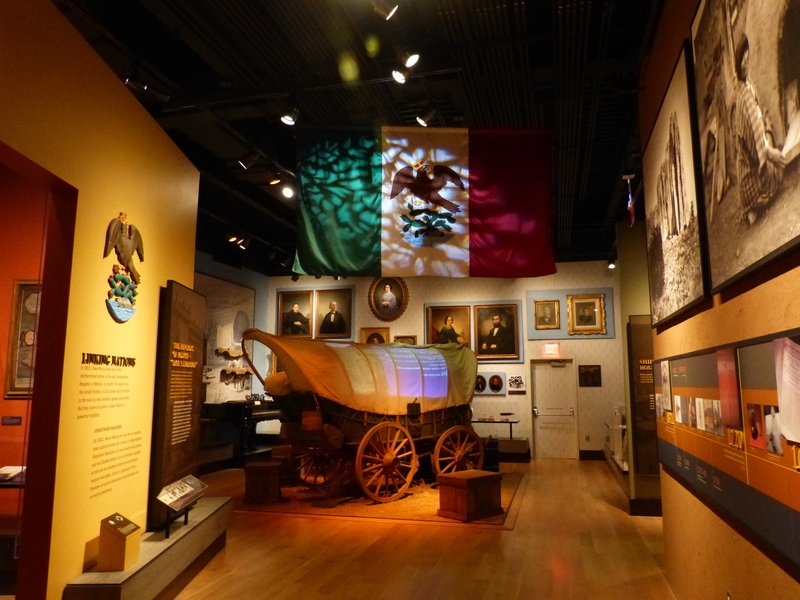 This entry was posted in Exploring, Food and drink, Holidays, Museums/galleries and tagged Four Corners, New Mexico by Emma Davidson. Bookmark the permalink.